me on to his homebrew head tracking Wii VR hack (see below), but his projects page is full of cool stuff (especially the community paint slingshot) and he's also funny (as evidenced by his videos and the names of his company -- Little Great Ideas -- and his blog -- Procrastineering.com). Watch the video, subscribe to the blog. Wow. I've been trying to make really good bread for many years with only mediocre bread as a result. About two years ago I clipped a great New York Times article about a fabulous new bread recipe. Unfortunately I didn't get the time to actually try the recipe until this past Christmas. And it is everything many people have described it as. Easy. Magnificent. Hard to screw up. Tasty. Moist. Fantastic. Mmmmm. Since Christmas I have made it about seven times and I continue to be amazed by it. Now I've begun to try some modifications, but it has been hard to improve on the original. 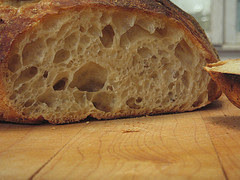 The basic trick is to use a very straightforward recipe (3cups flour, 1/4tsp yeast, 1 1/2cups water, stir together, let sit for 20hrs, fold down, let sit for two hours and then bake) with lots of water (when you fold the bread it will almost run through your fingers) lots of time (the first "sitting" is supposed to be at least 18hrs, but I have had good results with 24-30hrs) and a preheated dutch oven to bake (you bake in a covered pot that has been preheated with the oven to 450F, covered for 30mins and then uncovered for 20-30mins). Really, really simple recipe. Total working time (other than waiting) of about 15mins (including cleanup). And, really really good. You should try it too. It will change the way you think about making bread. In case you need more encouragement, here is a video and flickr stream showing the results. Update: I diverge from the recipe in two small ways. First, I use a bowl with plastic cling wrap for both of the risings (not cloth, which I have found to stick to the bread even when coated with flour) and I use parchment paper under the bread in the last rising so that I can easily pick it up and toss it into the hot pot. I tend to put the parchment paper in with the bread, though that doesn't make much of a difference either way, I just find it easier.